We present a fully automatic method to segment the skull from 2-D ultrasound images of the fetal head and to compute the standard biometric measurements derived from the segmented images. The method is based on the minimization of a novel cost function. The cost function is formulated assuming that the fetal skull has an approximately elliptical shape in the image and that pixel values within the skull are on average higher than in surrounding tissues. The main idea is to construct a template image of the fetal skull parametrized by the ellipse parameters and the calvarial thickness. 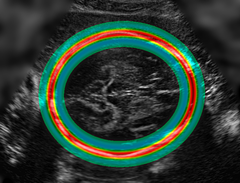 The cost function evaluates the match between the template image and the observed ultrasound image. The optimum solution that minimizes the cost is found by using a global multiscale, multistart Nelder-Mead algorithm. The method was qualitatively and quantitatively evaluated using 90 ultrasound images from a recent segmentation grand challenge. These images have been manually analyzed by 3 independent experts. The segmentation accuracy of the automatic method was similar to the inter-expert segmentation variability. The automatically derived biometric measurements were as accurate as the manual measurements. Moreover, the segmentation accuracy of the presented method was superior to the accuracy of the other automatic methods that have previously been evaluated using the same data. Any unauthorized use of the provided software and files for industrial or profit-oriented activities is expressively prohibited. By downloading any of the files contained in this site, you implicitly agree to all the terms of the TUT limited license. Please read the TUT limited license before you proceed with downloading any of the files. 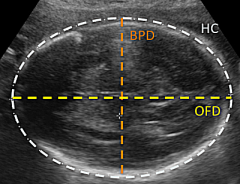 A. Foi, M. Maggioni, A. Pepe, and J. Tohka, “Head contour extraction from fetal ultrasound images by difference of Gaussians revolved along elliptical paths”, Proc. Challenge US: Biometric Measurements from Fetal Ultrasound Images, 2012 IEEE International Symposium on Biomedical Imaging (ISBI 2012), pp. 1-3, Barcelona (Spain), May 2-5, 2012.